MotoGP is the name for the world championship of Grand Prix motorcycle road racing. It is considered the pinnacle of the sport, with global manufacturers spending tens of millions to vie for the title and to promote their all-beating motorcycles. It is the ultimate destination for professional riders. Started in 1949 as the motorcycle Grand Prix championship, it was in fact many concurrent series, with separate races and world titles awarded in as many as 5 classes, all dictated by engine size. Since that beginning, motorcycles with the largest engines (and highest power rating and speed) were recognized as the ultimate challenge, and as such winning with them considered the grand prize. Over the years, Grand Prix motorcycle racing has undergone continuous change, driven mostly by the advanced motorcycle technology developed there. Unlike all other road racing series in the world, Grand Prix has always been based on the idea of prototype development rather than production-based motorcycles. That means that while the brand names being raced are also makers of motorcycles the public can buy, the racing machines themselves are designed and developed specifically for road racing. It is this distinction, more than any other rules, that separates Grand Prix from the rest. 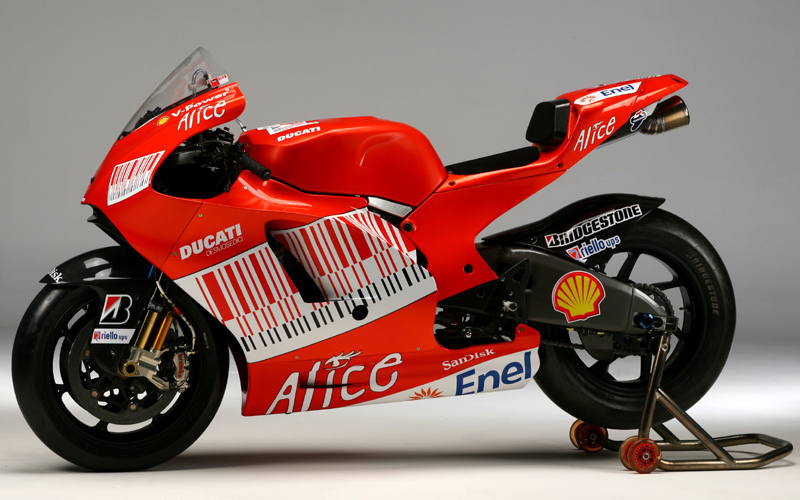 Todayʼs MotoGP prototypes boast more than 240 hp, weight less than 155 kgs, and can cost as much as $2M apiece. Just operating a MotoGP bike at a track requires at least three dedicated engineers, aside from at least one mechanic, because of the sophisticated array of electronics they use to make them work. Like a modern fighter plane, a MotoGP machine is highly unstable and can only make use of its colossal potential thanks to the intervention of computer-aided engine and chassis technology. As a technology incubator, many of these advancements have trickled down to consumer motorcycles, such as the widespread use of carbon fiber, electronic rider aids such as traction control, and manufacturing techniques for exotic materials and processes. Today’s amazing road legal motorcycles benefit directly from these innovations, making them easier and safer to ride, while boosting performance and reducing costs for the companies that offer them. The MotoGP championship takes place from March until November, in 18 races and countries. Teams can consist of up to two riders (although on rare occasions some large teams have fielded a third in recent times), who must first qualify for each race by running a timed lap and finishing within a few percent of the fastest time. Each race meeting begins with practice, typically on a Thursday, to set up the suspension and engine for the track (each track is different, requiring subtle changes to maximize the motorcycleʼs potential), then qualifying takes place on the Saturday before the race. Races are on Sunday, lasting about 45 minutes with the bikes covering a hundred or so kilometers at speeds that can exceed 300 km/h. 25 for victory, 20 for second, 16 for third, 13 for fourth, 11 for fifth and counts down one point all the way to 15th place, the last point scoring position. For detailed season by season information, visit the official website. Previous PostLong Termer: F800GSA – wheel fixNext PostWhere’s Ed?